Roads are as important to nations as blood arteries are to human body. Nations that do not pay heed to these arteries, unconsciously obstruct their way to economic prosperity. All over the world, when a country takes steps towards advancement, construction of new roads and reformation of the already existing infrastructure becomes inevitable. This Wednesday, dozens of students were injured in a protest against the privatisation of their institute outside the Punjab Assembly. Last week, the entire Davis and Egerton roads were blocked when the family of a bride who was burnt alive blocked the road with her dead body. Z-Block (commercial), near Y-Block McDonalds. 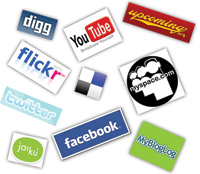 The concept of online social networking is gaining rapid popularity among Pakistanis. Presently, these networks are not limited to sharing pictures, videos and staying connected with family and friends. Rather, the popular social networks -- such as Facebook, Twitter and Youtube -- are being used for dissemination of information and gathering of ideas. People are using these platforms to lobby for their rights, as well. The incentives to perform an Agatha Christie classic, which already boasts an unbeaten record of being staged for the longest time (it is in its 58th year!) in London alone, could be various. For a school-level act, by what she calls a "non-gora" cast of characters, actor-turned-theatre-director Shahnaz Sheikh recently saw a "challenge" of its own kind. "It isn’t an easy play to perform," she said, talking to the audience at the end of LGS-Paragon’s fairly impressive rendition of The Mousetrap, held recently in the school’s under-construction hall. 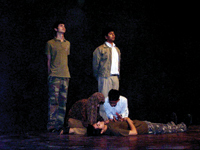 The Seeds of Peace held its second annual Inter School Dramatics Festival, 2010, last week. Ten teams from diverse backgrounds participated in the competition, creating a unique pool of students that mostly are not introduced to each other at events, encouraging them to understand the diversity that exists within our own community. A lot of roads in Lahore are waiting to be widened. One such road is Allama Iqbal Road leading to Garhi Shahu Chowk. Traffic blockage, pollution and encroachments have become a routine for commuters travelling on this road, which is undoubtedly one of the main arteries of the provincial capital. The road is one of the oldest roads in the city and connects various localities, for instance, Garhi Shahu, Dharampura and Northern Lahore with the Railway Station. A visit to the road reveals that people living on its both sides are facing a lot of problems, including traffic jams and at times accidents. The heavy load of traffic on this road is witnessed at Garhi Shahu Chowk where it intersects the road leading from Garhi Shahu Bridge to Queen Mary College. This chowk is one of the biggest bottlenecks in the city as there is literally no space for the traffic coming from all sides to turn left. According to a survey conducted by the Traffic Engineering and Planning Authority (TEPA), the number of daily vehicular traffic also called average daily traffic (ADT) plying on Allama Iqbal Road and passing through the Garhi Shahu Chowk is more that 100,000 vehicles. The road has three lanes but at times it becomes hard for the traffic to even move at a snail’s pace. A traffic signal is installed at the Garhi Shahu Chowk, but most of the times it is found switched off and traffic wardens are seen controlling the traffic manually. The main reason for frequent traffic jams at Garhi Shahu Chowk is commuters’ inability to avoid it while traveling to certain places, says SP City Traffic Lahore, Imtiaz Sarwar while talking to TNS. In the absence of alternative routes, they have to pass through Garhi Shahu Chowk whatever the situation of traffic is. He says people park their vehicles along the narrow road leading to Queen Mary College which aggravates the situation as the road gets narrower for regular traffic. The situation turns from bad to worse when the college time ends and people rush here to pick up their children. Similarly, he says, when vehicles descend from Garhi Shahu bridge they don’t find enough room to pass through Garhi Shahu chowk smoothly and cause traffic jams. 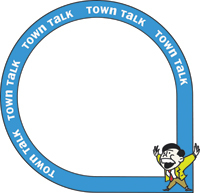 "The chowk has some technical faults in its construction and is not wide enough as needed. The situation gets from bad to worse when traffic has to be controlled manually," the SP City Traffic adds. He also holds general public responsible for the ever-escalating traffic congestion. Lack of awareness and general disregard for traffic laws among them worsens the situation, he adds. Shamsher Anjum, a motorist and daily traveller tells TNS the poor sewage in the area keeps the Allama Iqbal Road drenched in water. During rains, water gathers in Garhi Shahu chowk which is at a lower level than the adjoining roads. Engines of vehicles passing though knee-deep water often shut down. One can well imagine the situation that arises due to this, he adds. A proposal to remodel Allama Iqbal Road and end traffic jams in Garhi Shahu chowk was tabled in Punjab Assembly two years ago, says Raheela Khadim Hussain, a PML-N MPA who lives quite close to Garhi Shahu. She thinks that the only solution to the problem is to construct an underpass or an overhead bridge there. She says there is no problem with the bill and the project will start as soon as the required funds are available. "If you seek my opinion I will go for an overhead bridge," she adds. While a lot of people suffer from the above-mentioned issues, there is class which wants the traffic to wait on the road. These are the owners of juice corners, shawarma points, flower sellers, vendors etc who sell their products here while people wait for traffic signal to turn green. On average a commuter remains stuck here for three to five minutes before the signal changes. Salesmen employed by businesses dart towards the approaching vehicles to take orders which they deliver in a couple of minutes. Muhammad Azeem, a paan shop owner near Garhi Shahu chowk, tells TNS that mostly heavy rush of vehicles is witnessed during evening hours. "This is the time when I make most of my daily sales," he adds. When told there was a proposal for building a flyover here he just smiled. His body language said he had taken this as nothing more than a joke. Many other shopkeepers in the area had a similar view. Their point was that many plans were made in the past but nothing practical was done by any government to improve the situation. They said one of the plans failed for the reason that Pakistan Railways was not willing to part with its property situated right there in the chowk. How else could the chowk be widened? Director Engineering and Construction, TEPA, Khalid Mehmood Alvi tells TNS the authority has sent a proposal to the Punjab government to build a flyover at Garhi Shahu chowk. The proposed flyover will be one kilometre long and have pillars in centre. A similar bridge was constructed at Cavalry Ground, he says adding, "For this, neither we need to demolish the houses and commercial buildings nor do we need to acquire land." He says the bridge will be raised from Railway Cairn Hospital where the road is wide enough to build a fly-over and come to an end after one kilometre, where too the road is quite wide. Once the project is complete, traffic problems of the area will be solved to a great extent." Activism is one of the best aspects of life. It proves that we don’t merely survive the system but can direct and mould what exists according to what we think "should" exist. As a child, I was quite an activist myself. Usually I banged doors and cried. This bore fruitful results. However, my rare protest to a scolding, doing behind the sofa what should be done in the loo usually produced a violent counter-protest. My school, being a girl’s college was not protest-friendly. The college commonly prohibited jeans, fashion items, cell phones, for a brief stint even arriving past 9 in the morning. Once we protested against Israel in the Race Course Park which was reported in newspapers. Although the Palestinian crisis survived, we were encouraged that this public grievance against a distant hegemony caused no wrath by the administration. Protests are a delicate business in Pakistan. Firstly, we are still a somewhat closed society with very few forums to express ourselves. Secondly, protests are rare but often violent. Either the police attacks the protestors or vice versa. Something far less comprehensible is burglary and destruction during protests. A huge mob of protestors against the Danish blasphemous cartoons burnt the property on the 14th of February 2006, parts of buildings and Punjab Assembly on Mall Road Lahore and in Karachi last year, after a bomb exploded in an Ashura procession. The reality that activists escaped with valuable electronics, goods and medicines doesn’t seem related to their cause. In college, a few months after professing support for Gaza, we launched a protest against the fee increment. This time the fury was not invisible. Some faculty members reprimanded us. Since they determine who fails the class, we gave up our struggle. Obviously, no Nelson Madela emerged. An anarchic state can control your actions and block your speech but it cannot control your thoughts. Everything between your ears is sacredly yours. Therefore the street is not your only arena. The newspapers, canvas, the blank paper, theatre can all become your stage. Naguib Mahfouz, Dostoyevsky and Sarojini Naidu stood up in the face of adversity. Mandela penned his autobiography in jail. Protest is effective only when it has a genuine cause and ideology plus is carried out in a civilised way. If you cause traffic jams, burn a bus your protest has deviated from its original cause of bringing a change and has turned vindictive. The power to protest in great numbers can be misused when someone else pulls your string. At the start of this year, four teachers in our college were fired. This time a grand protest materialised with banners, camera coverage and slogans. The then principal was a progressive and foreign-qualified woman, unaware of the regal educational culture. Her three foremost flaws were excessive hard-work, over-timing and keeping checks on everyone. These caused discomfort to people in more places than one. To every protest that the faculty staged, students added the drama, cheering, colours and slogans. Eventually the not-so-colonial principal was ousted. If you remember Toba Tek Singh, the short story by Manto the first key incident is that a madman shouts political slogans and slips in a fit of passion. This is another major flaw in our protesting techniques (other than running away with other people’s goods). We get overtly emotional. Make it sublime, even polite. The flowery verses of Faiz and searing poetry of Jalib outlasted all dictators. Martin Luther King’s "I have a dream" is a cliché of hope for every oppressed community. Since everyone is not that creative, a facebook status, letter to the editor, writing on a wall or phone text message will do. At least don’t throw stones and burn buildings. Let us remember that Quaid-e-Azam never took the law in his hands to protest. May it be the notorious Rowlatt "Black" Act, Congress’s bias or the Nehru Report. He resigned from the Viceroy’s Council in the first case, resigned from Congress and joined Muslim League in the second and responded to the last with his famed "Fourteen Points". He strongly protested when Bhaghat Singh, Gandhi or even Muslim Leaguers resorted to any illegal activity or violence. A truth which history has proven is that the protestor can enter the historical limelight. Those who read the "Case of Exploding Mangoes" are amused at the depiction of Pakistan’s most oppressive dictator. Similarly, a few weeks back I went to the college bathroom and discovered a wall cartoon of a teacher. The caption said "Stop being a pain ". Dictators hardly miss such historical scorns. *Film: Gulliver’s Travels on Dec 22 at DHA Cinema. *’Sher Ki Baat’ is a series of fortnightly lectures given by Dr. Arfa Syeda on Wednesdays on Faiz’s poetry at Faiz Ghar. Timings: 5:00pm to 6:00pm. *’Story hour’ for children 5 years and above at Faiz Ghar on Fridays from 3:45pm to 5:00pm. Who can forget the tragic death of three-year-old Imanae Malik at Lahore’s Doctors Hospital in late November 2009? The aggrieved parents did whatever they could to get justice and to highlight the doctors’ negligence. Facebook page "Justice for Imanae Malik" still exists on social network. Over 175,000 people have joined the page so far -- also used by people in search of blood donors in case of emergency. Again, recently the cyber networks such as Youtube and Facebook were widely used by students of Kinnaird College (KC) to raise their voice online against removal of some competent teachers by the college principal. At times when media was not allowed to cover the protests inside the college, these cyber circles were used by journalists to get information and work on stories to highlight the issue. KCites used these networks to spread the word and to mobilise other students. Eventually, the KC principal was shown the door. Many student organisations, entrepreneurs, political personalities, sportsmen and people from different walks of life have created groups and pages on Facebook to highlight their activities. Take the case of cricketer Zulqarnain Haider, who mysteriously disappeared before the 5th and final one-day international against South Africa in Dubai in early November 2010. His message on Facebook ultimately helped the world know about the reason behind this disappearance. Punjab Governor Salman Taseer is quite regular with his catchy tweets on national and international issues. Besides being followed by his family and friends, Taseer is also followed by many journalists -- for whom his few words become a story! Former President Pervez Musharraf is also known for his Facebook account. It is through this social network page that he is still connected to the country. Journalists have used these social networks as a powerful tool to gather news, investigate, share stories with readers the world over, and develop contacts. More so in crisis situations. When the Iranian government imposed a media blackout in 2009 many journalists in Iran, depending on social networks like Twitter and Youtube, covered the country’s elections and their efforts were widely appreciated by international media later. Another important incident often quoted to highlight the importance of social networks is the coverage of a US air crash (US Airways flight 1549) in the Hudson River in New York in January 2009. The story was broken on Twitter and the first ever picture of the incident appeared on Twitter as well -- much before the mainstream media covered the incident. In Pakistan, illiteracy is undoubtedly the biggest challenge today as far as the utility and importance of modern microblogging services is concerned. Out of an estimated population of 180 million people some 60 million individuals are illiterate while out of the total educated lot the country has around 20 million internet users. This shows as to how enhanced literacy rate and especially computer literacy can bring reforms and changes in the lives of people, besides boosting and improving working of developing media in Pakistan. Basically, from social injustice to governance issues, politics, sports and religion and many other aspects, almost everything is being discussed and debated online -- not just to sharpen public opinion but to spread the word across the globe through the worldwide web. "Not only are the dialogues lengthy, but the names of the characters as well as the places mentioned [in the play] are rather alien for today’s generation and, hence, difficult to remember and pronounce," Shahnaz explained. She was obviously referring to the Ralstons, Metcalf and Paravicini; not to forget, the haunted mansion called Monkswell Manor. An audience not quite familiar with the play and its setting would especially have to take its time to warm up, which is what seemed to be the case here. However, all said and done, LGS-Paragon put together a show which was well-acquitted, credit for which is due to its lead actors, a mix of students from A1 and O2, led by Aurangzeb Rathore as the intrepid Sergeant Trotter, Namwar Ayaz as the effeminate Christopher Wren, Minahil Malli as the rather ‘mannish’ Miss Casewell, Murtaza Chaudhry as the prim and proper Major Metcalf and Hamza Kamal as Mr Paravicini, the chuckling foreigner-with-an-odd-accent. Hamza seems to have become a bit of a ‘cult’, at least among the ‘Paraknights’, and he draws a huge response every single time he utters a dialogue or uses his body language in the way that he does famously. No wonder he has become a ‘fixture’ in a Shahnaz play. Simply, The Mousetrap is about how this wide array of characters is stranded inside the just-opened guest house of the jolly good couple Mollie and Giles Ralston, played convincingly by Zoya Zaidi and Fareed Ishaque, because of a blizzard. A killer is said to be on the loose and, to make matters worse, every character who enters Monkswell Manor is sporting a black coat, a scarf and a felt hat -- exactly the description of the homicidal maniac himself. The Ralstons are upset also because the telephone is out of order. Enter Sergeant Trotter and the plot thickens, literally, because the audience now expects each character to be looked at with deep suspicion in addition to facing the threat of death. Humour of the black kind is created when the sergeant is unable to prevent murders in the house. Whereas Shahnaz said she had stuck faithfully to the original script, the duration of the play was considerably brought down to an hour and half "because the audience’s patience begins to run out after this much time". Thankfully, the editing didn’t seem to harm the impact of this single-set, rather unpretentious school adaptation of a 20th century literary giant. The teams performed a 15 minutes skit on the theme of "Shades of Grey." The plays were staged by students of grade 9-11 who took up different issues including inter-sect marriages, hopelessness and its solution, extremism and its after-effects etc, in the society and presented their view on ‘shades of grey’ in these issues. The students of National College of Arts (NCA) also gave a guest performance on the event. Saeed Ibrahim, Ahmad Khan and Aneeq Cheema judged the performances of the participants. The best male performance trophy went to Awais Khan whereas Shehrezad Mohyuddin was judged to be the best female performer. The Drama Festival was won by SICAS boys whereas Trust School was runner up this year. LGS Defence stood third. The play "Badalta Hai Rang Asmaan Kasiay Kaisay" won the first prize. The story moved around a lady who is married against her will. Her husband is an addict who beats her and demands money from her. They are issueless. The lady prays to God for a child and is finally endowed with one after many years of marriage but the baby boy is blind. The lady thanks God for listening to her prayer but her husband is not happy. He wants money for drugs. He beats his wife and curses her for giving birth to a blind boy. The boy hates his father for cruelty towards his mother but the woman always tells him that her husband is the basic security behind her as he has provided her with a home. One day her husband dies and the woman is shocked but her son ensures her that he will be her right hand she can show him the way and he can work hard. BSS Garden Town presented a story of a common house in Pakistan, which is full of fun, laughter, and life and how for no reason they are attacked and killed. There are still few honest people ready to lay their life for the sovereignty of their country, while others are killing for few pennies. Sacred Heart Convent presented a story of two girls with different opinions about inter-sect marriages and how they fare through life. SICAS girls came up with Jane, an artist, who is very disappointed because of the continuous failure in life and believes that she will never be able to do anything worthwhile in her life. Her friends, Joe and Emily encourage her and make her believe in her talent. By the end of the play, Jane is motivated and begins to see the light in her life. Trust School, Harbanspura staged a play adapted from Dr Faustus by Christopher Marlowe. 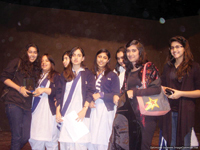 Trust School, Thokar Niaz Baig, which bagged second position, presented "Merchant of Venice". The schools included two branches each of Beconhouse School System, Lahore Grammar School, Salamat School System and The Trust School. The girls from Convent of Jesus and Mary as well as Sacred Heart Convent also participated in the drama festival. Sajjad Ahmad, President Seeds of Peace emphasized that prevailing environment of extremism in the society makes it necessary for peace activists to encourage peace related activities and provide our youth an opportunity to express themselves. The SOP is a non-profit, non-religious and non-political organisation dedicated to preparing teenagers from areas of conflict with leadership skills to promote co-existence and peace. The organisation, at its international summer camp brings together children from several countries together. The youth spend three and a half weeks interacting with people from all over the world and particularly with their ‘enemy’. Built around the perhaps seemingly simple but nonetheless integral concept of ‘the enemy has a face’, the campers eat and sleep in the same bunks and indulge in a daily 90 minute dialogue with their ‘enemy’ nations, where many issues and misunderstandings are brought to light. They also play various games. Pakistani teens first attended the international camp in the summer of 2001 and since then a small delegation of students are sent to camps each year. To ensure sustained participation and dedication to the cause, follow-up programmes are conducted year-round for Seeds of Peace graduates in their home countries including different competitions, mini-camps, speaker series, home stay programmes, leadership workshops and community work. The current drama competition is a part of the follow-up programme.